Gorman's desert parsley as seen on the south-facing slopes of Sevenmile Hill in the Columbia River Gorge...........February 15, 2016. Note the lack of a mid-stem leaf which helps identify this species. 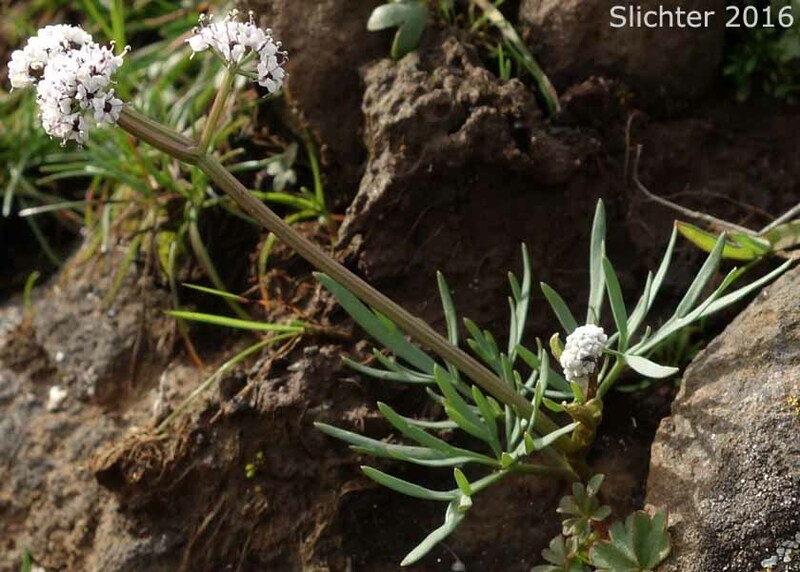 The photo at right shows a flower head of Gorman's desert parsley ? as seen atop Stacker Butte in the Columbia River Gorge.........April 11, 2008. As noted below, Gorman's desert parsley is similar to both Piper's and Geyer's desert parsleys. Many text have previously lumped both Gorman's and Piper's desert parsleys as Lomatium gormanii. The information presented here tries to differentiate L. gormanii from the other two plants. Gorman's desert parsley is a minute-haired perennial wildflower with one to several erect to ascending flower scapes from 15-55 cm tall arising from an almost spherical root up to 2.5 cm thick. The one to several leaves are all attached to the stem at or below the ground. The blades are 3-6 cm long and ternately divided and then divided pinnately again one or two times. The narrow, linear segments are 3-12 mm long and 1-2 mm wide. The flower scapes are 3-8 cm high and are longer than the leaves. 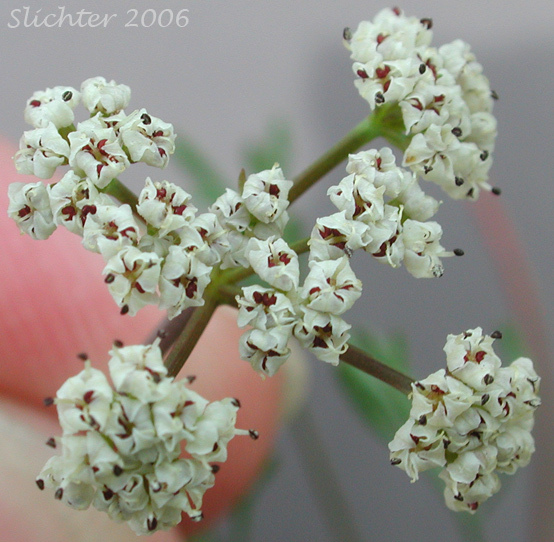 The inflorescence is an umbel with 2-10 unequal rays up to 25 mm long. 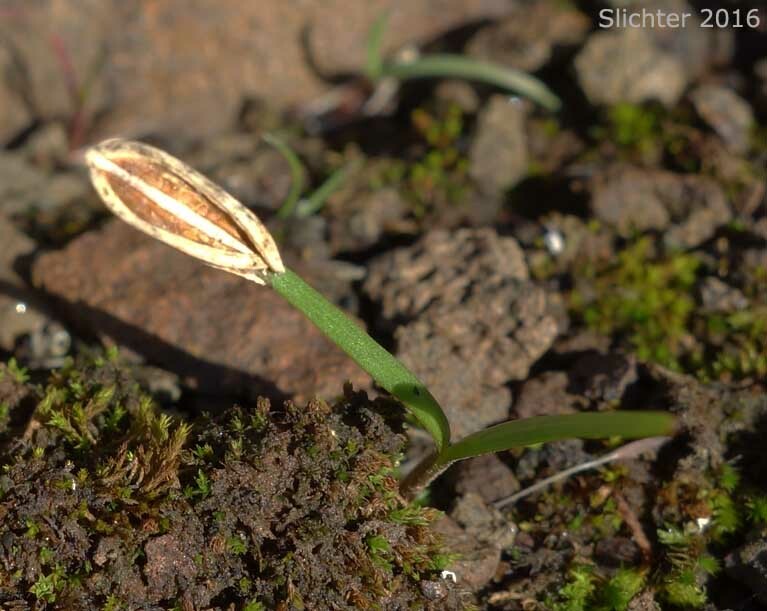 The bracts at the base of the umbellets are narrowly lanceolate or linear and most typically less than 2 mm long. The pedicels are up to 2 mm long in fruit. 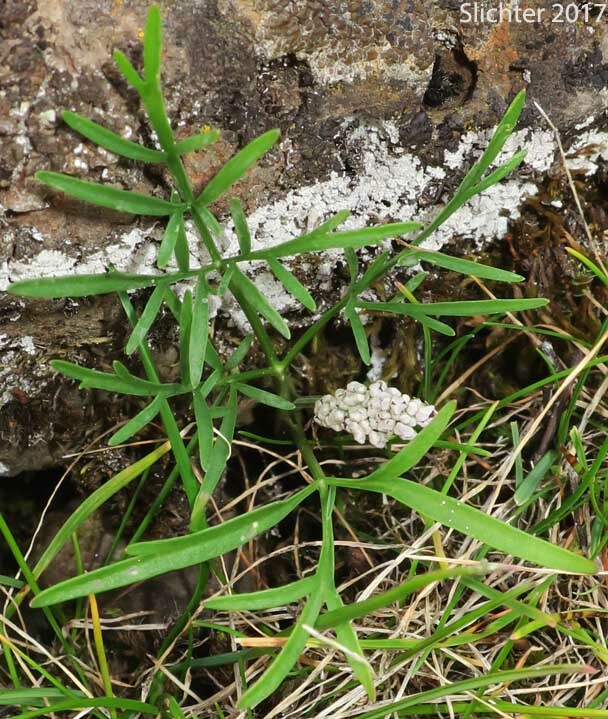 The flowers are white with purplish anthers and the umbellets are each few-flowered. The fruits are elliptic or narrowly ovate in shape with wings about half as wide as the body. The fruits measure from 5-7 mm long. Geyer's Desert Parsley: Lomatium geyeri - Plants from 15-40 cm tall at maturity. The glabrous fruits are 7-12 mm long and the bracts of the umbellets are 2-3 mm long. 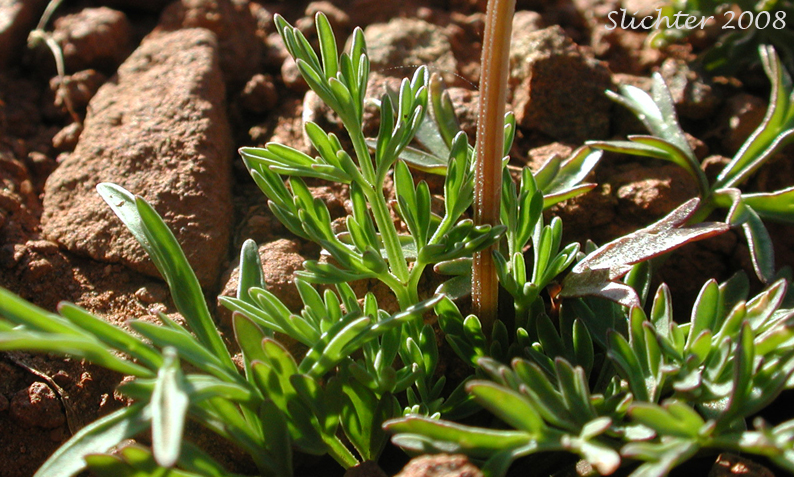 Salt and Pepper, Gorman's Desert Parsley: Lomatium gormanii - Plants up to 15 cm tall. Fruits minutely pubescent. The minutely pubescent fruits are 5-7 mm long and the bracts of the umbellets are typically less than 2 mm long. Salt and Pepper, Piper's Desert Parsley: Lomatium piperi - Plants up to 15 cm tall. 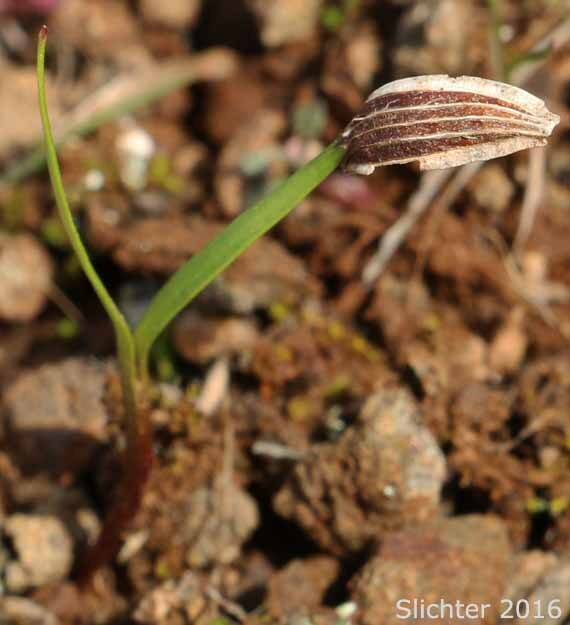 The glabrous fruits are 5-7 mm long with the bracts of the umbellets typically less than 2 mm long. 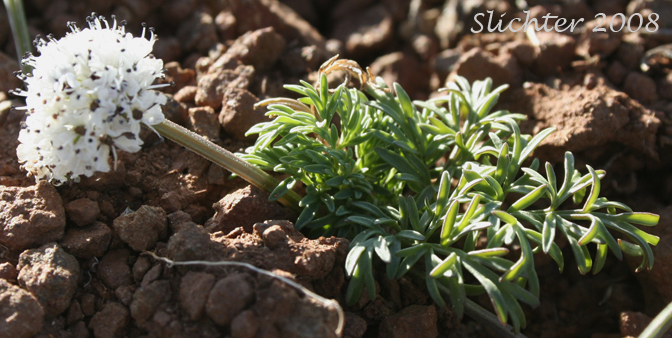 Gorman's desert parsley may be found on open slopes and flats in grassland as well as scabland. 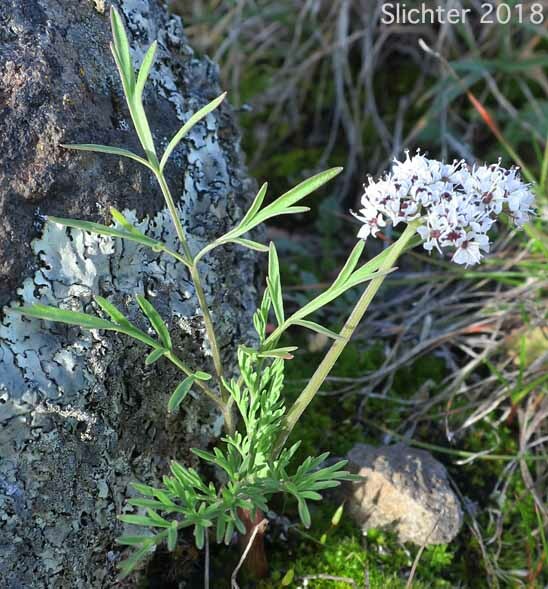 Gorman's desert parsley may be found east of the Cascade Mts. from north-central Washington south to north-central Oregon and perhaps to southeastern Oregon. It may be found eastward to Idaho. The similar Piper's desert parsley may be found over much of the same range (often side by side) but is also found south of Gorman's desert parsley through south-central Oregon into northeastern California. In the Columbia River Gorge, it may be found at the crest of the Columbia Hills. The photo at left shows the basal leaves and lower floral scape of Gorman's desert parsley as seen atop Stacker Butte in the Columbia River Gorge........April 11, 2008. The photo at right shows a very early blooming Gorman's desert parsley in bloom above the Crawford Oaks Trailhead atColumbia Hills State Park.........November 18, 2017. This is the earliest blooming salt and pepper that we've observed in bloom in the Columbia River Gorge. They can occasionally bloom in December during mild winters, but more typically begin bloom by mid-January most years. What might be Gorman's desert parsley (left) as seen along the fisherman's trail along the east bank of the Deschutes River about 4 miles north of its mouth.......January 28, 2012. The photo at center shows a sprouting seedling of Gorman's salt and pepper on west-facing slopes high above the Deschutes River near Ferry Springs, Columbia River Gorge........January 24, 2016. The photo at right shows what may be a seedling of Gorman's salt and pepper as seen on vernally moist slopes above the Crawford Oaks Trailhead, Columbia Hills State Park........February 23, 2016. The photo above shows Gorman's desert parsley Gorman's desert parsley as seen at Hog Lake to the west of Sprague, WA.........April 29, 2006. There is no leaf or bract on the floral scape. Note the long slender root at right. 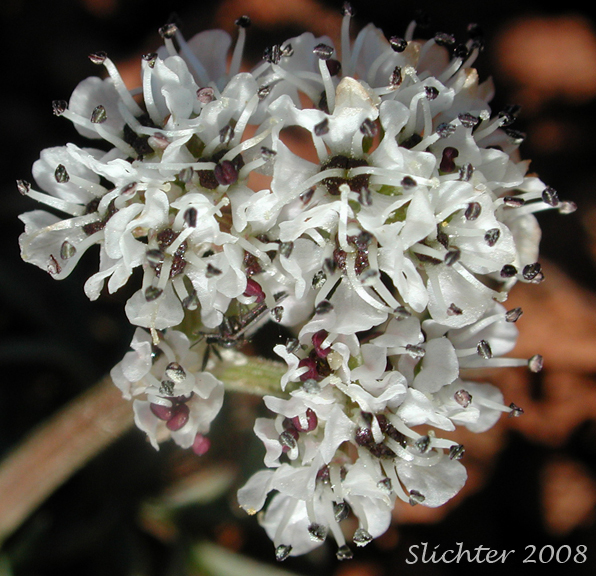 The photo above shows a close-up of the inflorescence of Gorman's desert parsley as seen at Hog Lake to the west of Sprague, WA.........April 29, 2006. 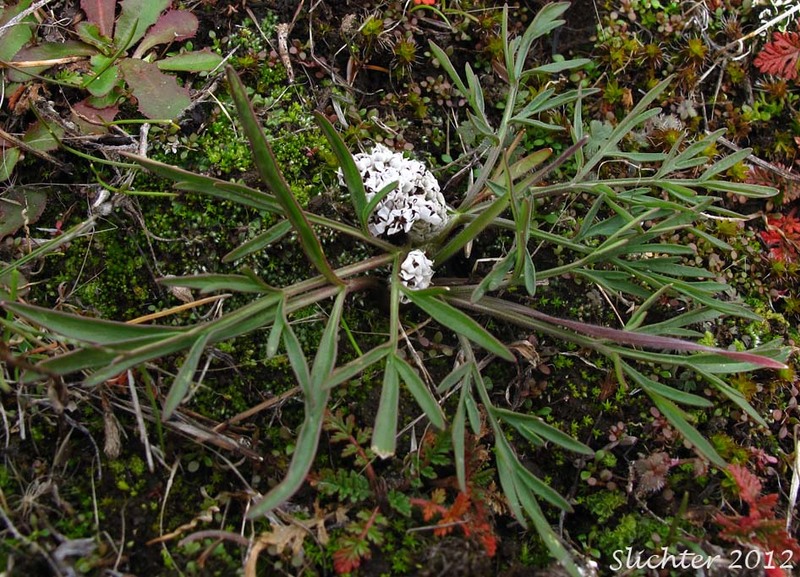 The photo above shows Gorman's desert parsley as seen atop Stacker Butte in the Columbia River Gorge.........April 11, 2008. A very early blooming Gorman's desert parsley in bloom above the Crawford Oaks Trailhead atColumbia Hills State Park.........February 3, 2018. Note again the lack of a leafy bract on the lower third of the floral scape.